Anyone who grew up reading Laura Ingall Wilder’s Little House on the Prairie series will especially enjoy Parsons’ book, because while the locale is far removed from the prairie, the fresh, honest, easy-reading evokes Wilder’s style. Parsons tells it as she remembers it, and she has a gift for honing in on the interesting and skipping the mundane. And so, tragically, history repeated itself with the drowning last summer of little Ace Horton, almost the same age as Parsons at the time, and who also apparently was sucked into a vortex near the fishing pier. And now, of course, crab cakes are more expensive than steak. Want to read more from the book? A pre-publication chapter entitled “Liquid Refreshment” appeared in the Wave last September. CLICK to read. 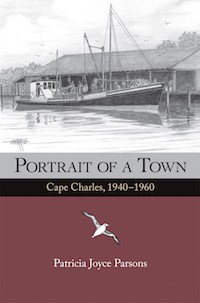 What a pleasure it was to read Portrait of a Town: Cape Charles, 1940-1960. 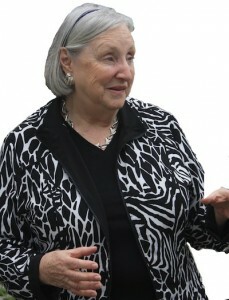 Patricia Parsons brings Cape Charles to life with stories served up in well crafted vignettes. For the Eastern Shore local or the weekend traveler, this gem of a book is a great read! I am anxious to read your book! Growing up in Cape Charles was lots of fun. It was such a friendly and close knit little community. Hope to see you Friday, Pat. How can I get a copy of Pat Parsons book? I grew up in Cape Charles and would like the book. Please forward all information to order book, price, shipping time, etc.